Probably the best sci-fi blog out there is io9. Today, an, in a way, byzantine USAF flow chart was posted there which is supposed to help ASAF staff to decide what to post when responding to blog posts, found on the web, which relate to the organization. 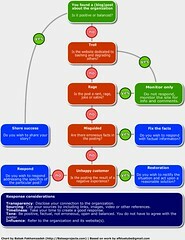 The original is getting a lot of flack from commenters on io9 and I understand why: If you need a chart like this to decide what and how to post in response to blogs you read, you probably shouldn’t be posting in the first place. However, I’ve found that when dealing with organizations in less tech savvy societies and trying to get their employees over the threshold to start engaging with social networks as well as blogs, these people often find the task daunting, sometimes almost afraid to actually type in a few words and hit the ‘submit’ button. A chart like the above can actually lower the threshold and make it easier for those who show reluctance to start participating by being able to have something tangible to fall back on. If the result is that the chart is only needed for the first two or three times the individual responds to a blog post, it’s fine, if it meant that the individual, with the chart as a backup, started responding in the first place. So, I adapted the original flow chart a bit and came up with what you see above.